I found this awesome Mole Salt by Amola at where else, Salt and Sundry, and have used it to season avocado toast and punch up my hot coca. I realized that since it already has some spices like coca and cinnamon in it that I could throw it into a spice blend and skip some steps. This spice rub would be great on pork as well but my man was asking for steak so for Fiesta Friday we went with Carne Asada. For carne asada what you really want is a nice crust on the outside so I made sure to include some brown sugar in the spice rub to help caramelize the meat. I used a flat iron steak which I like because it has a good amount of fat but isn’t too thick so it cooks quickly. I also like skirt steak for this – flank, which is usually my go to steak is a little too lean for me but is certainly traditional for carne asada. This would be great with my tex mex quinoa salad on the side or Mexican beans and greens. Carne asada is also perfect for steak tacos – make sure to serve them up with my HOT habanero sauce and some sour cream. Mix the spices together in a small bowl. Pat the meat dry and rub all over both sides with the spice mixture. Let sit at room temperature for at least 30 minutes, up to an hour. Light your grill on high and grill 3 to 5 minutes per side depending on the thickness of your meat and how you like your steak done. Cover with tin foil and rest for 10 minutes before slicing against the grain. Mix the spices together in a small bowl. Pat the meat dry and rub all over both sides with the spice mixture. Let sit at room temperature for at least 30 minutes, up to an hour. Light your grill on high and grill 3 to 5 minutes per side depending on the thickness of your meat and how you like your steak done. Cover with tin foil and rest for 10 minutes before slicing against the grain. I often get in the trap of boneless chicken breasts, flank steak and pork tenderloin on repeat for weeknight dinners. They are all quick, easy and pretty lean but when I saw veal cutlets or scallopini the other day I thought them perfect for a break in my routine. These cook super fast so really the only hassle is “sewing” the prosciutto and sage to the cutlets. Set up a little assembly line like below and do it in the morning or the night before and then just dredge and cook, cutting the time to dinner even more. This would be delicious all sitting over a bed of pasta or rice to sop up the sauce, or served with a green salad and some crusty bread (uh again to sop up that sauce). I always order this when I see this on a menu but now I may just add it to my own weeknight repertoire! First prepare the scallopini – salt and pepper the veal then top with a slice of prosciutto (you may have to cut the slices to fit. Lay several sage leaves on top. Using a toothpick or small skewer (a regular skewer cut in half works as well) thread in between the veal and the toppings to affix them to each other. Do this for each piece of veal – it doesn’t really matter what it looks like, just make sure the veal can lay pretty flat and that the prosciutto wont fall off the veal. Dredge in the flour and shake off the excess. In a large skillet heat over medium high 1 to 2 tablespoons of olive oil, enough to coat the bottom of the pan. Add as many veal pieces that comfortably fit in the pan and cook for 2 minutes, flip and cook for 2 minutes more. Remove to a plate and repeat with the rest of the veal, adding more olive oil if needed. Once all the veal is cooked reserve it on the plate covered with foil. Add the white wine to the plan and deglaze any browned bits. Swirl in the butter, lemon zest and juice and let cook together for about 3 minutes until it thickens a bit and comes together as a sauce. Carefully take out the skewers, pour the sauce over the veal and serve. First prepare the scallopini – salt and pepper the veal then top with a slice of prosciutto (you may have to cut the slices to fit. Lay several sage leaves on top. Using a toothpick or small skewer (a regular skewer cut in half works as well) thread in between the veal and the toppings to affix them to each other. Do this for each piece of veal – it doesn’t really matter what it looks like, just make sure the veal can lay pretty flat and that the prosciutto wont fall off the veal. Dredge in the flour and shake off the excess. In a large skillet heat over medium high 1 to 2 tablespoons of olive oil, enough to coat the bottom of the pan. Add as many veal pieces that comfortably fit in the pan and cook for 2 minutes, flip and cook for 2 minutes more. Remove to a plate and repeat with the rest of the veal, adding more olive oil if needed. Once all the veal is cooked reserve it on the plate covered with foil. Add the white wine to the plan and deglaze any browned bits. Swirl in the butter, lemon zest and juice and let cook together for about 3 minutes until it thickens a bit and comes together as a sauce. Pour over the veal and serve. While it’s starting to feel a bit more like spring here in DC, it’s still pretty cool in the evenings, meaning warm comforting dishes are still in demand. Nothing beats a classic spaghetti and meatball dinner, which can please just about anyone in your family. My dad used to make this dish for me when I was little and it’s the first thing I remember cooking right alongside him. I have flirted with a lot of other recipes, most of them much more complicated, but none were as good as my dad’s. One big change from what he used to do is broiling the meatballs versus cooking them in a skillet. It uses a lot less oil but also is a lot cleaner because you don’t have hot oil spitting at you. I find that the meatballs stay together a lot better this way as well once added to the sauce. I may have taken some liberties with the fennel seeds and parm rind but the student should always try to surpass the master right?? This dish really is best if you have the time to let the meatballs and sauce cook a while together, hours if you have them. The good news is that it’s just as good if not better reheated so you can make them and then freeze and pull out whenever you want some comfort food. Paired with a caesar salad (my dressing is awesome and so easy) and some garlic bread it’s a great end to the day. In a large skillet or wide dutch oven heat the olive oil over medium heat. Add the onions, garlic, fennel seeds, crushed red pepper and a pinch of salt and cook for about 7 minutes until the onions are soft and translucent. Add the tomato paste and stir to combine. Cook for another minute or so then add the wine to deglaze and get any bits off of the bottom of the pan. If you have a parmesan rind throw it in there along with the basil and sugar. Add in the cans of tomatoes, being careful not to splatter any on yourself. Stir to combine and then increase the heat to medium high until bubbles form. Turn the heat back down to low and let simmer while you make the meatballs. While the sauce simmers combine the beef with the rest of the meatball ingredients. This is easiest to do with your hands but don’t over work the meat, combine just enough so all the ingredients are evenly distributed throughout the mixture. Turn on your broiler. Using your hands form meatballs around the size of golf balls and place them on a baking sheet (if you have cooking spray it never hurts to coat the pan so the meatballs easily come off). Place the baking sheet in the broiler and cook for about 15 minutes until the meatballs are nice and brown. Add them to the sauce, I like to use tongs for this, being careful not to break the meatballs. Nestle them in and use a spoon to make sure the meatballs are covered in the sauce. At this point you could serve the whole thing but I like to let it all simmer together for at least another 30 minutes if not an hour. The more time you give this the more the sauce will flavor the meatballs and vice versa. When you are near ready to serve, boil the pasta, drain well and serve the meatballs and sauce on top along with the chopped basil and mozzarella if you have it (remember to fish out the parmesan rind if you used it). The meatballs and sauce will last in the fridge several days or frozen for 6 months. In a large skillet or wide dutch oven heat the olive oil over medium heat. Add the onions, garlic, fennel seeds, crushed red pepper and a pinch of salt and cook for about 7 minutes until the onions are soft and translucent. Add the tomato paste and stir to combine. Cook for another minute or so then add the wine to deglaze and get any bits off of the bottom of the pan. Add in the cans of tomatoes, being careful not to splatter any on yourself. If you have a parmesan rind throw it in there along with the basil and sugar. Stir to combine and then increase the heat to medium high until bubbles form. Turn the heat back down to low and let simmer while you make the meatballs. While the sauce simmers combine the beef with the rest of the meatball ingredients. This is easiest to do with your hands but don’t over work the meat, combine just enough so all the ingredients are evenly distributed throughout the mixture. Turn on your broiler. Using your hands form meatballs around the size of golf balls and place them on a baking sheet (if you have cooking spray it never hurts to coat the pan so the meatballs easily come off). Place the baking sheet in the broiler and cook for about 15 minutes until the meatballs are nice and brown. Add them to the sauce, I like to use tongs for this, being careful not to break the meatballs. Nestle them in and use a spoon to make sure the meatballs are covered in the sauce. At this point you could serve the whole thing but I like to let it all simmer together for at least another 30 minutes if not an hour. The more time you give this the more the sauce will flavor the meatballs and vice versa. When you are near ready to serve, boil the pasta, drain well and serve the meatballs and sauce on top along with the chopped basil and mozzarella if you have it (remember to fish out the parmesan rind if you used it). The meatballs and sauce will last in the fridge several days or frozen for 6 months. Growing up in an Irish family in Boston, you pretty much take it for granted that everyone celebrates St. Patrick’s day. I didn’t realize until I left the nest that EVERYONE celebrates St. Patrick’s day. And who could blame them? The Irish are the friendliest people you will ever meet, love to drink, eat, dance and have a good time. No wonder everyone wants to be Irish! St. Patrick’s day is a terrific excuse to have a party or at the very least a nice tall Guinness. However, I had to take my celebrations to a whole new level when I met my husband, Patrick. Every March 17th I make this incredible soda bread made with brown butter and rosemary and have plenty of Irish whiskey and beer on hand to share with our friends. This year I thought my man should have his very own stew with all of his favorite things included. Jameson, Guinness and coffee pretty much fuel Patrick so I added those to a hearty beef stew and came up with the perfect way to celebrate this year. Sláinte! Preheat your oven to 400 degrees. Make sure all of the pieces of beef are around the same size, if not cut them until they are. Sometimes I am lazy and buy the precut stuff (or it is on sale) but often they are all weirdly shaped. It’s worth taking the time to cut them all the same so they cook at the same time. Salt and pepper the beef cubes. In a large dutch oven heat 2 tablespoons of the olive oil over medium high heat. When hot add half of the beef cubes, making sure not to crowd them. Let them cook about 5 minutes and don’t mess with them much or they won’t get brown. Flip and cook the other side for 5 minutes and then remove them to a plate. Add another tablespoon of oil (if necessary) and add the remaining beef cubes, repeating the 5 minutes then flip and 5 minutes more routine. Add the second batch to the plate and toss in the bacon. Let the bacon cook until starting to crisp, about 3 to 4 minutes and then add in the chopped onion, leek, carrots, garlic and butter. Leeks, onions and carrots = the Irish flag! Salt and pepper everything. Cook for another 3 to 4 minutes until the onion and leek have softened. Sprinkle on the flour and stir to combine. Cook for another minute until all the flour is absorbed. Add the Jameson and let cook for 1 minute. If you have butchers twine tie the herbs together and add, otherwise just toss them in. Add the beef broth, Guinness and coffee and stir to combine. Bring to a simmer then cover and put it in the oven. Cook for an hour and a half, stirring once. At the very end fish out the herbs then stir in the frozen pearl onions and frozen peas and cook for a minute or two more either in the oven or on the stovetop until they are heated through. The stew can be served right away, kept in the fridge for a couple of days or frozen for several months. Preheat your oven to 400 degrees. Salt and pepper the beef cubes. In a large dutch oven heat 2 tablespoons of the olive oil over medium high heat. When hot add half of the beef cubes, making sure not to crowd them. Let them cook about 5 minutes and don’t mess with them much or they won’t get brown. Flip and cook the other side for 5 minutes and then remove them to a plate. Add another tablespoon of oil (if necessary) and add the remaining beef cubes, repeating the 5 minutes then flip and 5 minutes more routine. Add the second batch to the plate and toss in the bacon. Let the bacon cook until starting to crisp, about 3 to 4 minutes and then add in the chopped onion, leek, carrots, garlic and butter. Salt and pepper everything. Cook for another 3 to 4 minutes until the onion and leek have softened. Sprinkle on the flour and stir to combine. Cook for another minute until all the flour is absorbed. Add the Jameson and let cook for 1 minute. If you have butchers twine tie the herbs together and add, otherwise just toss them in. Add the beef broth, Guinness and coffee and stir to combine. Bring to a simmer then cover and put it in the oven. Cook for an hour and a half, stirring once. At the very end fish out the herbs then stir in the frozen pearl onions and frozen peas and cook for a minute or two more either in the oven or on the stovetop until they are heated through. The stew can be served right away, kept in the fridge for a couple of days or frozen for several months. These are O.M.G good. Life changing. You can also make them in less than 10 minutes, give or take grating cheese time. How is that possible you ask? Your best friend the freezer. Remember these amazing short rib tacos from a couple of months ago? Well you made a big batch like instructed and froze a bunch for later. 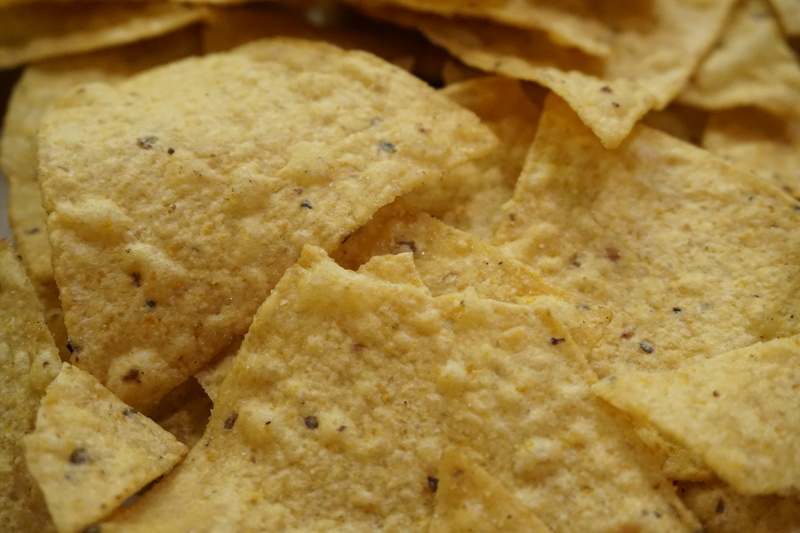 Now is the time to dig them out of the freezer and spread them all over a huge mound of chips and cheese. Seriously, if you are going to take the time to make a slow cooked item like short ribs, it takes the exact same time to cook enough for 4 as it does for 6 (or 10 for that matter) so go ahead and make way more than you need. 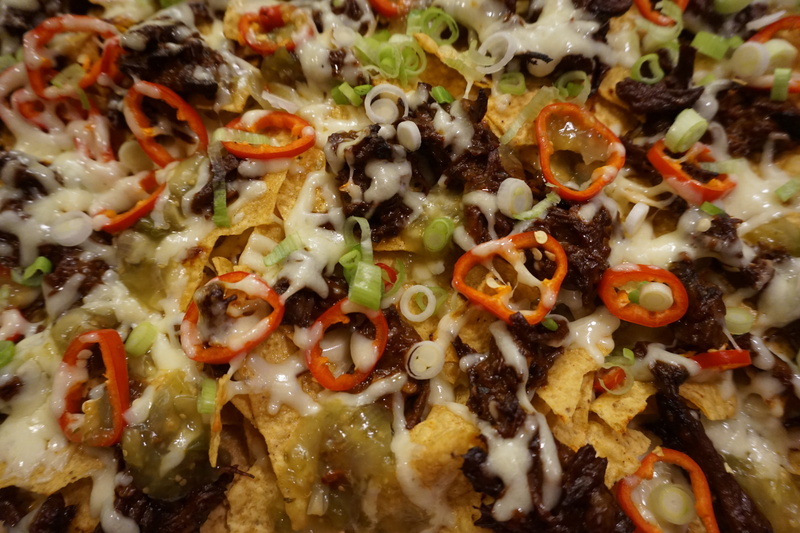 Then when Thursday night football rolls around and you realize you don’t have a fabulous football meal planned for mid-week you can absolutely kill it with these nachos. If you don’t have those short ribs tucked away in your freezer go ahead and throw some shredded chicken on here – really this is just a method. Swap out cheddar for jack cheese or red salsa for green – it’s a great way to get rid of stuff hanging around in your fridge. 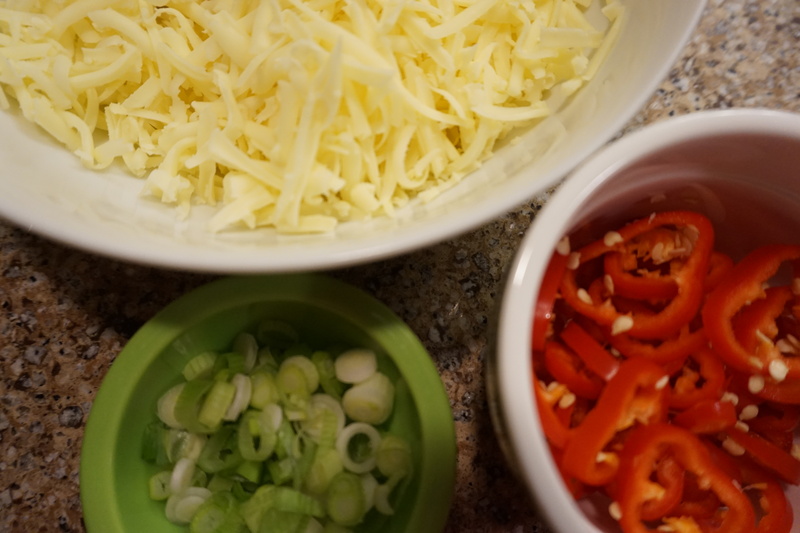 One pro tip courtesy of my husband – make sure to take the extra step of tossing half the chips and cheese together before topping with the rest. That ensures you don’t just end up with one layer of cheese, neglecting lots of the chips. This made the perfect football dinner (yep just for two people, no judging) but it would also make a great appetizer for Fiesta Friday. I went ahead and just ate these babies straight off of the cookie sheet because I didn’t want to waste time transferring them to something nicer but for a dinner party just use two spatulas to transfer, should happen pretty easy with all that cheese acting as glue! Preheat your oven to 425 degrees. On a cookie sheet spread half of the chips and half of the cheese and toss together. Top with the rest of the chips, then evenly distribute over top the rest of the cheese, the chilis, the short ribs and the salsa. Bake for 6 to 7 minutes until all the cheese is melted. Sprinkle with the scallions and dollop on the sour cream or serve on the side. As the weather heats up I start looking to the grill more and more for quick and easy dinners. The thought of turning on an oven just makes me sad and there is nothing better than grilling dinner on the deck, drinking a beer and watching the sun set. This steak is so stupid simple and comes together really quickly. Marinate it the night before and all you have to do it throw it on the grill with some scallions. Pair with some rice (I like to make big batches and then freeze individual portions in plastic baggies to make my own instant rice). If you want to amp up the veggies maybe throw some peppers on the grill as well or even green beans or snap peas (as long as you have a grill basket). Leftovers are also delicious tossed on a salad or some cold udon noodles. Fire up that grill! In a large plastic baggie combine the soy sauce, vinegar, sesame oil, brown sugar, chili paste, garlic and ginger. Add the skirt steaks and let marinate for at least an hour or overnight. Heat your grill to high and grill the steaks for 4 minutes. Flip the steak and add the scallions to the grill diagonally so they don’t fall through the grates. Let the steak cook for another 4 minutes or so, flipping the scallions once so they get grilled on both sides. Let the steak rest under some tinfoil for 5 to 10 minutes then slice thinly across the grain and serve with the grilled scallions. In a large plastic baggie combine the soy sauce, vinegar, sesame oil, brown sugar, chili paste, garlic and ginger. Add the skirt steaks and let marinate for at least an hour or overnight. Heat your grill to high and grill the steaks for 4 minutes. Flip the steak and add the scallions to the grill diagonally so they don’t fall through the grates. Let the steak cook for another 4 minutes or so, flipping the scallions once so they get grilled on both sides. Let the steak rest under some tinfoil for 5 to 10 minutes then slice thinly across the grain and serve with the grilled scallions.